KRYPTADE is now available in New Zealand. It is an approved animal remedy under the ACVM Act 1997. It is recommended for the treatment of dehydration of calves, and particularly of calves with scours associated with cryptosporidiosis. This is an international breakthrough in treatment of calves with cryptosporidiosis. Calves typically return to milk 24 hours earlier, take 40% less electrolytes to recovery, with treatment periods reduced from typically 7- 8 days down to 3 – 4 days. Farmers observe brighter, more alert calves earlier when treating with KRYPTADE. How Important is Cryptosporidiosis (or Crypto)? Crypto is present on many farms. Estimates are typically about 30% of dairy farms. The death rate from affected scouring calves is typically 10% in uncomplicated infections, but may be as high as 30% in septicaemic (dehydration, shock, and hypothermia) calves with secondary infections. What are the Specific Signs of Crypto scours? None. You are unable to distinguish it from other causes without faecal samples. Many calves with crypto, and rota scours lose their appetite. Scours from combined infections have a more severe effect. Calves scouring usually have diarrhoea which may last 5 to 12 days before the calf recovers its appetite for milk. Typically this is 6 days. How do I find out if Crypto is the cause of the scours in my calves? There are now tests which are available for use on-farm. Please consult your vet though on how to interpret any results. Alternatively, ask your vet for sample pottles, and take samples from a minimum of 4 scouring calves. Ask your vet to test to identify crypto, and to also test to exclude rotavirus, coronavirus, E coli and other important causes such as salmonella. Many calves will have multiple infectious agents present identified, so veterinary advice will be important. How do my calves get infected? On infected farms it is considered that some cows (typically 15%) may be shedding crypto at the time of calving (winter only). Any faecal matter on tractor trays used to carry calves, a shed used for calf rearing, implements used to feed calves, esp anything calves may find to lick or suckle. Are all Calves at risk of developing Crypto Scours? 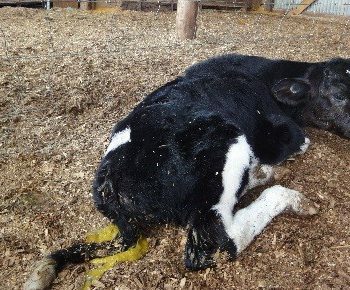 Typically scours will only occur in calves up to about 25 days of age, but this is also commonly found with other causes of calf scours. 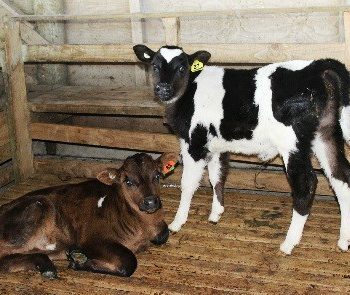 Most calves show signs from 6 days of age through to 21 days with the highest numbers showing signs of scours about 8 -10 days. Many calves will become infected without showing signs. Scours will affect up to 30% of the calves being reared. Many costs cannot be identified easily. We know that experienced calf rearers work under tight constraints of time and budgets, and hospital mobs take a disproportionate amount of time. Because scouring continues for a number of days, and younger days seem to take longer to recover, treatment is extremely time consuming with a depressive effect on the calf rearers. The actual delay in reaching weaning weight targets means numbers of calves being fed increase and this increases staff work loads until they are ready to wean. Crypto infections by themselves are not associated with high mortality rates, only prolonged recovery periods when scours develop. When calves have mixed infections e.g crypto and rotavirus, mortality rates can climb alarmingly up to 25 to 30% of calves being reared. This is particularly important among those calves with inadequate colostrum immunoglobulin transfer. This group of calves can account for 75% – 80% of mortality and is primarily due to bacterial infections leading to blood borne infections. This group may get significant benefit from antibiotic treatment.